Leon Haslam took victory in a thrilling race at Silverstone after getting the better of Be Wiser Ducati’s Glenn Irwin with a final lap pass. 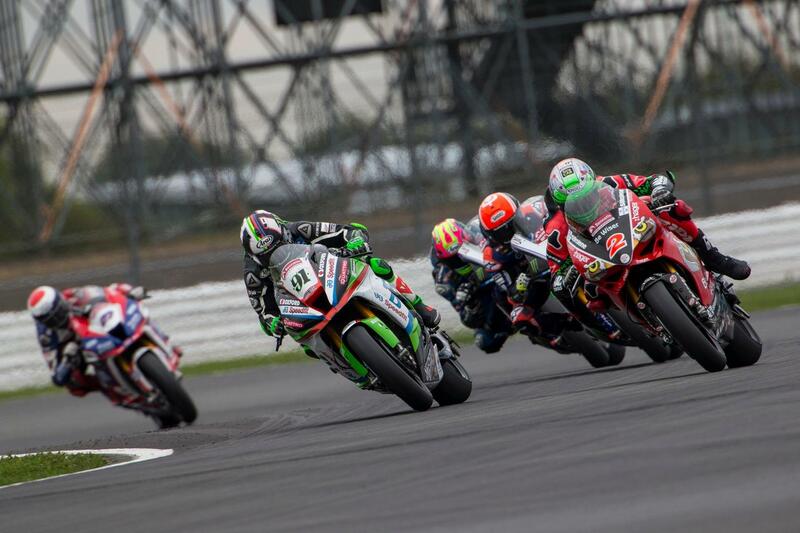 The JG Speedfit Kawasaki’s tenth win of the season didn’t come easy, however, with a 30-lap dogfight across Silverstone’s national circuit seeing six different riders lead one of the closest races of the year. Polesitter Bradley Ray shot to the lead on the opening lap, but disaster would soon strike for the young gun as he crashed out at Becketts on lap four, gifting the lead to RAF Regular and Reserve Kawasaki’s Jake Dixon. Dixon’s lead would be short-lived as the McAMS Yamaha of Josh Brookes came charging through, but it was the Aussie’s young gun team-mate Tarran Mackenzie who was on the move. After passing Dixon for second, Mackenzie started sniffing around the rear of his team-mate before making his move at Brooklands on lap 15. Be Wiser Ducati’s Irwin struggled in the early stages with a full fuel load, but as the race went on he made his way through the pack to second. After a number of failed attempts to take the lead from rookie Mackenzie, Irwin finally moved into the lead at Brooklands with six laps to go but the McAMS Yamaha man wasn’t going to take it lying down. However, series leader Haslam was waiting in the wings and a bold move around the outside at Brooklands saw him move into the runner-up spot. This left two separate duels in the final few laps with Irwin and Haslam trading the lead on numerous occasions while the McAMS Yamaha duo battled it out for the final rostrum finish. Irwin led onto the Wellingtons straight for the final time, but Haslam came charging by at Brooklands to seal the win by 0.171 seconds while Mackenzie held off team-mate Brookes by 0.043 seconds for his career-first BSB rostrum. Despite a late resurgence, Jake Dixon crossed the line fifth ahead of Honda’s Jason O’Halloran. Luke Mossey was seventh, beating showdown hopeful Peter Hickman with Gino Rea taking a seasons’ best result in ninth. Tommy Bridewell completed the top ten. Irwin and Brookes were able to confirm their Showdown places, but Ray’s crash denied the Buildbase Suzuki star from doing the same. Peter Hickman’s top ten sees him hold on to sixth with a 12-point advantage over Buchan, who fought through from 23rd on the grid to finish 13th. Christian Iddon, riding with a broken collarbone, finished 15th to take a single point and now sits 22 points off a showdown spot. Jake Dixon will start tomorrow’s opening race on pole ahead of Bradley Ray and Josh Brookes. Race winner Leon Haslam starts fourth ahead of Tarran Mackenzie with Glenn Irwin completing the second row.